Breakfast or dinner. Hot or cold. Just plain, or with a salad. 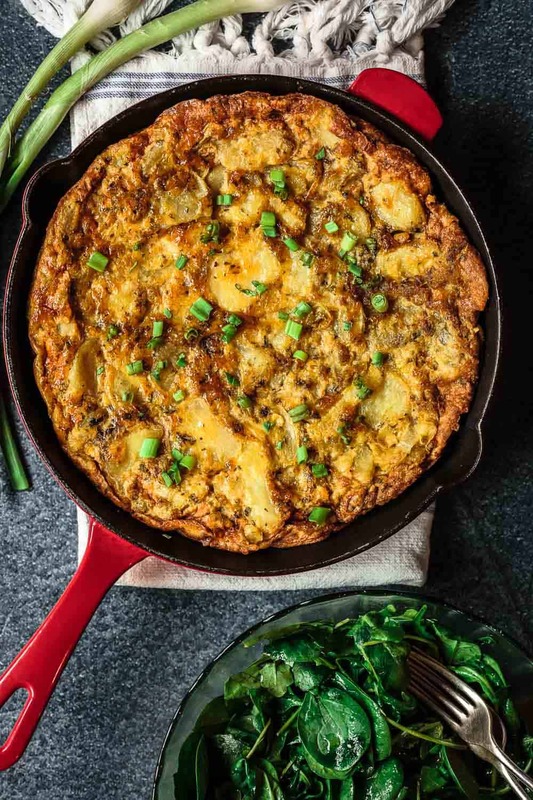 Tortilla espanola–Spanish tortilla, or Spanish Omelet–is that one dish that works in all cases. 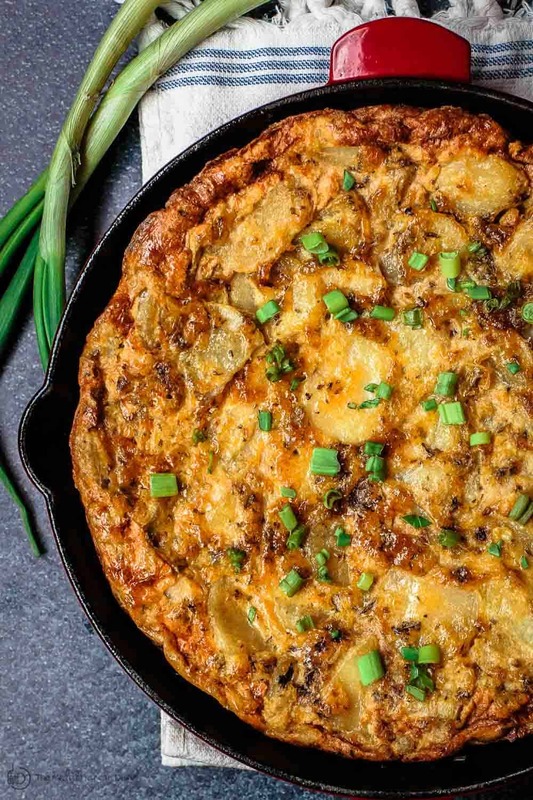 This Spanish tortilla with eggs, potatoes and onions, is simple. You may already the ingredients needed right in your fridge and pantry! To complete the meal, I like to add a little salad next to this hearty Spanish tortilla. Be sure to see serving suggestions below. If you’re not familiar, Spanish tortilla is a simple dish of four main ingredients: eggs, potatoes, quality olive oil, and onions. I’ve heard Spanish tortilla described as the Spanish version of an omelet or a fritatta. A Spanish omelet, if you will. Melissa Clark of the New York Times describes Spanish tortilla best as a solid cake with just enough egg to bind the soft, sliced potatoes. 1. In my quick research, I came across a great tip from Daniel Gritzer of Serious Eats: Salt the eggs first! This helps them retain moisture during cooking! 2. But, the main work in this Spanish omelet is in gently cooking the potatoes and onions in quality extra virgin olive oil. Plenty of olive oil actually; at least one cup of it. I used Private Reserve olive oil. As the potatoes and onions cook low and slow in the oil, the EVOO imparts great flavor and turns them velvety and luscious. Spanish tortilla is often served as tapas in Spain along with other nibbles and drinks. But it makes an equally satisfying brunch or even dinner next to a simple salad. You’ll see, I mixed a simple spinach and arugula salad; this peppery salad is the perfect complement to the velvety Spanish tortilla. If you need a bigger salad, try fattoush or this Mediterranean chickpea salad. I love that Spanish tortilla can be served hot, warm, or at room temperature. It’s the perfect make-ahead for a special brunch! 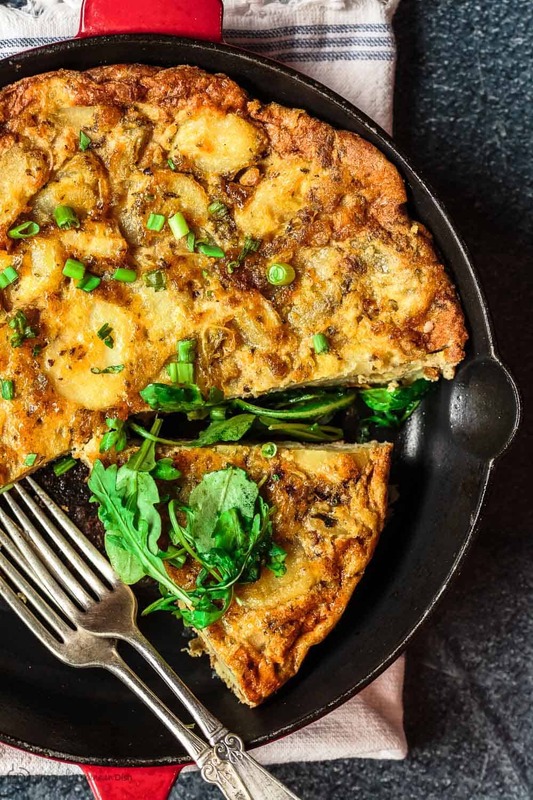 Can you Make this Spanish Tortilla ahead? What to do with Leftovers? You can make this a night or so ahead. Let cool completely before storing in the fridge in a tight-lid container. Leftover Spanish tortilla are great served just at room temperature or even cold. If you want, you can heat in a medium-heated oven until warmed through. NEVER MISS A RECIPE! JOIN MY FREE E-MAIL LIST HERE TO RECEIVE NEW RECIPES, WEEKLY MEDITERRANEAN DINNER PLANS, AND MY FREE E-COOKBOOK WITH 15 HEALTHY RECIPES TO TRY! SHOP OUR ONLINE STORE FOR QUALITY OLIVE OILS, ALL-NATURAL SPICES AND MORE. In a big bowl, whisk together the eggs, salt, paprika and oregano. Set aside for now. Prepare a 10-inch oven-proof nonstick skillet or a well-seasoned cast iron skillet. Heat the olive oil in the skillet over medium-high heat, watching until shimmering. Add potatoes, onions and scallions to the oil (don’t worry, at first, they won’t all seem to fit, but with a little stirring, they’ll compress as they cook.) Lower heat immediately to medium-low (you’ll want to control the heat making sure it continues to gently bubble). Cook for 25 minutes, stirring occasionally, until potatoes are very tender. Use a heat-safe strainer over a heat-safe bowl to drain olive oil (keep the oil aside for now). Season the potatoes well with salt. Give the eggs a quick whisk and add the potato mixture to the eggs, freeing the skillet up. In the skillet, heat 3 tbsp of the reserved oil over medium heat. Pour in the egg and potato mixture, and gently press to even out the top. Reduce heat to medium-low. Cook uncovered for 2 minutes, then transfer to heated oven for 5 minutes or so to finish cooking, watching carefully. Invert onto a serving plate, or leave to serve directly from pan. I like to add a garnish of chopped scallions. Set aside for 10 minutes or so before serving. Meanwhile, in a salad bowl, toss the spinach, arugula, salt, spices, lemon juice and a drizzle of olive oil together. 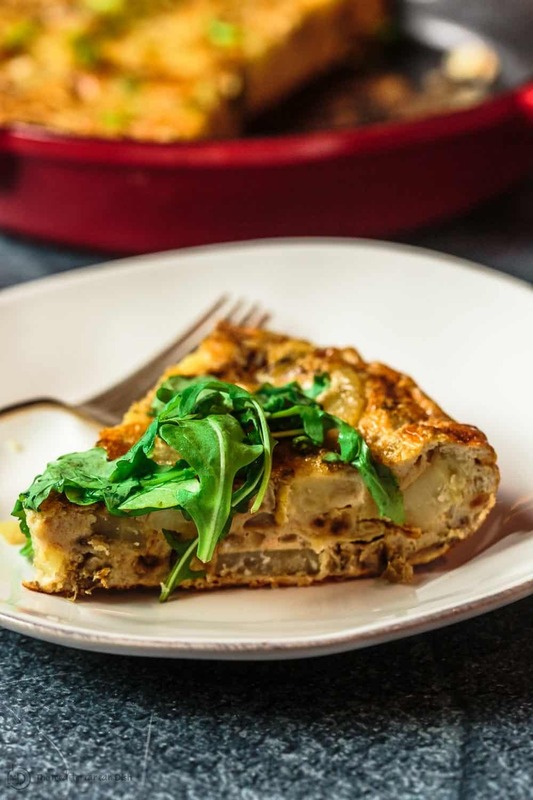 Slice Spanish tortilla into 6 slices and serve with the spinach and arugula salad. Add crusty bread, if you like. Enjoy! Make Ahead and Leftovers: You can make this a night or so ahead. Let cool completely before storing in the fridge in tight-lid container. Leftover Spanish tortilla are great served just at room temperature or even cold. If you want, you can heat in a medium-heated oven until warmed through. Recommended for this Recipe Our Private Reserve extra virgin olive oil. From organically grown and processed Greek Koroneiki olives. And from our all-natural spice collection: Sweet Spanish Paprika. SAVE! Try our Greek extra virgin olive oil bundle and our Ultimate Mediterranean Spice Bundle! Or create your own 6-pack spice bundle from our organic and all-natural collections! Prepare a 10-inch oven-proof nonstick skillet or a well-seasoned cast iron skillet. Heat the olive oil in the skillet over medium-high heat, watching until shimmering.Add potatoes, onions and scallions to the oil (don’t worry, at first, they won’t all seem to fit, but with a little stirring, they’ll compress as they cook.) Lower heat immediately to medium-low (you’ll want to control the heat making sure it continues to gently bubble). Cook for 25 minutes, stirring occasionally, until potatoes are very tender. Hi, thank you for this really tasty dish. It was my first time at it and, therefore, took a little longer to make than expected. Wanted to make sure those potatoes cooked through. 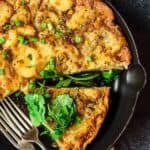 This Spanish Tortilla with the suggested salad fits into any meal of the day and is delicious. Maria, I am so glad to hear it! Thanks for giving this one a try. Hi, Can I give this recipe to a diabetic patient? Hi there. Thank you for question. I am not an expert on diabetes so can not advice you on this. Perhaps ask the patient or consult an expert or a doctor. Yummy. My son would love this recipe. I can’t wait make it for him. Hi William. If you prefer to salt the eggs later, that will be fine as well. Wow! Great. Thanks a lot, Suzy. I heard about spanish tortilla recipe. But yet now didn’t get an opportunity to have a pinch of taste. Thank you for sharing this recipe so that I can try this out. Waiting for more spanish dishes. Wonderful, Joanne! Glad you found the recipe. Look for more Spanish inspirations here in the future.